Just being around him or thinking about him makes you blush. When someone says his name, you get butterflies in your stomach. If these scenarios sound familiar, you are probably wondering if you should make the first move and kiss him. Don't take a chance without taking this quiz to see if kissing is a good idea. 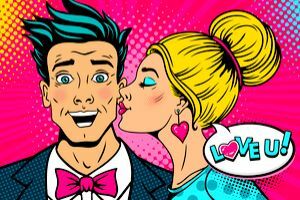 These perceptive quiz questions will determine if your crush wants you to kiss him or if you are simply imagining that he returns your romantic feelings. If you have had a crush on someone for a long time, at some point you have probably wondered if you should just take a chance and kiss his gorgeous lips. However, what if you make a move and he rejects you? You could ruin your friendship and your chances for anything more forever! On the other hand, what if you never reveal your true inner feelings and he moves on to someone else? Kissing someone is quite risky, so it's best to analyze your relationship a bit before you make any hasty decisions. This perceptive quiz will ask you some intriguing questions about yourself and how you and the man you are interested in interact with each other. At the end of the quiz, you will receive some advice that will help you make an informed decision about whether you should pucker up or leave your lips to yourself. So, without any further ado, let's commence this entertaining and useful quiz right now!